A complete redesign after a year away has the Nissan Armada returning for 2017 with a new V8, an upgraded interior, and a whole new look. People love to make predictions, and for years we’ve been hearing about the imminent death of the 3-row, body-on-frame SUV. The redesigned 2017 Nissan Armada (along with modestly priced gasoline) says you won’t need to buy a black suit for the funeral anytime soon. 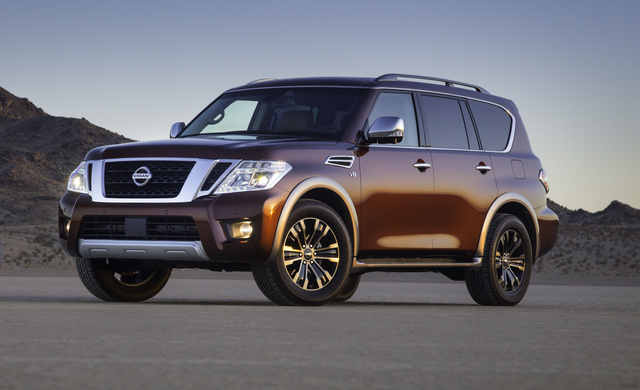 Now based on the world-famous Nissan Patrol, the Armada gives up its previous Titan parentage for more car-like livability in an industry dominated by crossover SUVs. With a new 5.6-liter V8, the '17 Armada adds a lot more horsepower but strangely has a reduced maximum towing capacity. 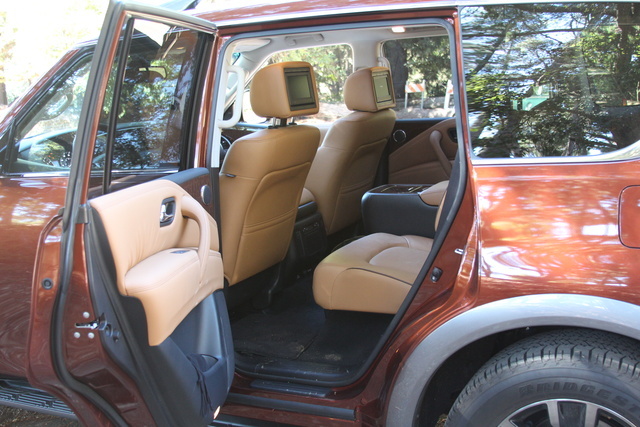 But it’s the interior that’s the real show-stopper with this new Armada. Upgrades in materials plus acoustic glass and a lot of sound insulation mean the Armada is a very comfortable place to chew up some miles. 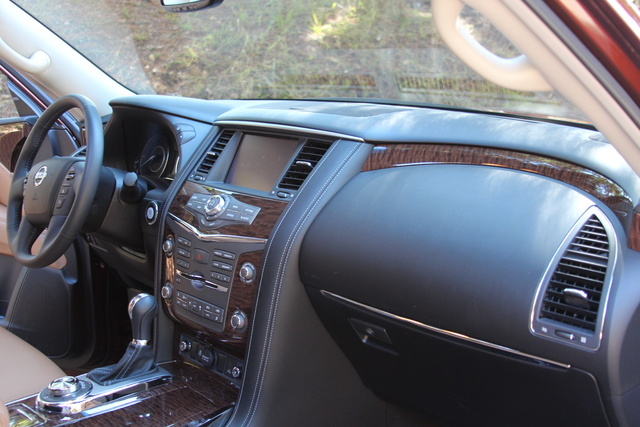 With the Armada now based on the Infiniti QX80/Nissan Patrol, coupled with substantial interior upgrades, what you’re looking at here is essentially Infiniti quality at a Nissan price. That’s hard to pass up. 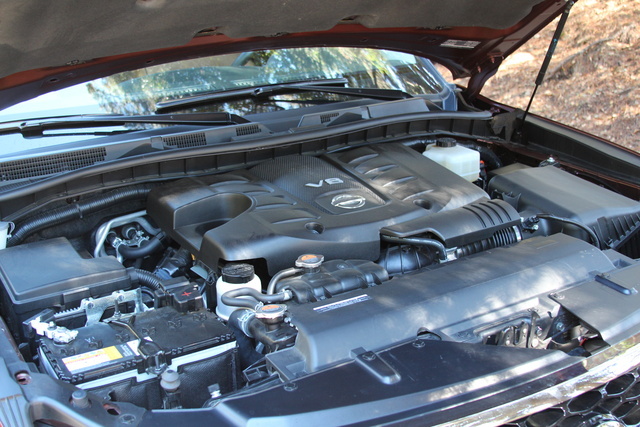 More than that, the Armada’s base SV trim gets you a ton of standards for its mid-$40K starting MSRP. Features that are options for competitors like auto LEDs, dual-zone auto climate control, front and rear parking sensors, and a 13-speaker Bose stereo are included here, not to mention heated power seats, navigation, and a full-size spare. You also get 18-inch alloys, roof rails, and full-length functional running boards, keyless ignition and entry, a rear-view camera, and an 8-inch touchscreen. An $1,120 Driver’s Package will add power for the 60/40 third-row bench seat and liftgate, an auto-dimming rear-view with HomeLink integration, fog lights, and a towing harness. The SL trim starts at $49,650 and adds several features including the nearly necessary 360-degree top-down camera, but you’ll also get leather, 20-inch wheels, remote engine start, power for the tilt-and-telescoping steering wheel, driver memory functions, and auto wipers. A $1,700 Technology Package will further enhance safety with adaptive cruise, blind-spot monitoring and warning, plus forward-collision warning with avoidance braking front and rear. I also have to recommend the $800 moonroof package, which adds the power-sliding and tilting glass that makes things a lot brighter in the interior. Of course those come standard in the $57,590 top-tier Platinum trim, along with extras like ventilation for the front seats, unique 20-inch wheels, a rear entertainment system with dual 7-inch monitors, and power-folding heated mirrors with puddle lamps and integrated signals. Safety is further enhanced with lane-departure warning and intervention, and the interior is dressed up with a ton of “wood” trim. If 8-person capacity isn’t necessary, the $450 second-row captain’s chairs are a nice touch, along with the accompanying second-row console. The Platinum Armada I tested was fitted with these, and along with the $2,900 jump up to AWD (available at any trim level for the price) and a $995 destination charge, the final price came to $61,435. A new, Tennessee-built, 5.6-liter V8 is the heart of every Armada, regardless of trim level, and they all get a 7-speed automatic transmission. From there you get to choose rear-wheel or all-wheel drive (RWD or AWD), depending on how much safety or off-road prowess suits your needs. If you choose AWD, the Armada’s EPA-estimated combined rating of 16 mpg drops by 1 in every category, with 14 city and 19 highway dropping to 13 and 18 respectively. This is a poor showing, even in this admittedly thirsty category, and worse yet I managed to stay only barely above 11 mpg in my tow-free week with the Armada. Competitors are able to best the Armada’s numbers by several miles per gallon, and as gas prices start to rise again, this will be a more significant distinction. 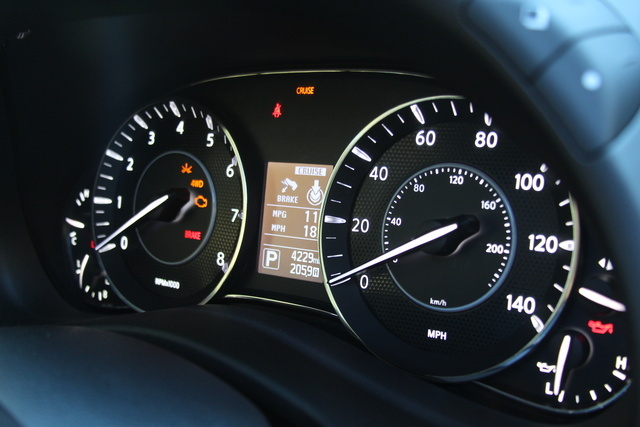 Still, the Armada managed to raise its average fuel economy by 1 mpg even though it added 70 hp and a few lb-ft of torque to its power output from 2015. Maximum towing capacity drops 500 pounds versus the 2015 Armada, but at 8,500 it’s still besting competitors like the Tahoe/Yukon. With a 6.5-second 0-to-60 time, it’s hard to call the Armada slow. After all, it’s dragging around 5,600 pounds without any cargo or passengers. But the power delivery from this 7-speed transmission can be sluggish at times, as you floor the accelerator and wait for the downshift to come. Until then, you’re hearing a lot of noise but not exactly feeling the power. With 390 hp and 394 lb-ft of torque, I just expected it to be more immediately fast, but peak torque doesn’t arrive until around 4,000 rpm, so you’re going to have to wait a bit. I also noticed something peculiar when sitting in thick traffic among the Bay-area hills. When moving at slow speeds up a steep incline, the transmission would jump and judder as it tried to find the perfect gear, leading to a less-than-elegant shake ’n’ shimmy as I tried to inch forward. This should happen only at slow speeds on very steep hills though, and if you were off-road, the low-range gearing and 50/50 torque split would prevent this entirely. Speaking of off-road, while the Nissan Patrol on which it’s based offers near-professional levels of rock-climbing capability, the new Armada has had a lot of its off-road goodies stripped. That means no decoupling sway bars, no locking differentials, and no Hydraulic Body Motion Control Suspension. Instead we’ve traded all that for more on-road manners via a softer “American” suspension tune, but with the aforementioned low-range gearing and nearly 9 inches of ground clearance, the Armada should be able to handle your general level of car-camping off-roading. If you’re looking for a true rock-crawler, I’d look elsewhere. Despite growing in both length and width, the 2017 Armada’s wheelbase is actually shorter than the 2015's, and along with the softer suspension tune, this means you’ve got a much more car-like ride than previously. The Armada even still comes with hydraulic power-steering assist, which is a curious inclusion here. Normally I’d never complain about hydro-assist, but the steering feel and feedback on the Armada is pretty numb and vague, obviating the main reason to stick with a hydro setup. Why not go to electro-mechanical and pick up another mpg or two? The new Armada's 8,500-pound maximum towing capacity means you’re not giving up much functionality, either. At 500 pounds less than the 2015’s 9,000-pound rating, it’s a small penalty for the new engine's extra power and fuel economy. The same can be said for storage. In 2015, the Armada’s total storage capacity was 97 cubic feet, and this year that drops to 95.4. 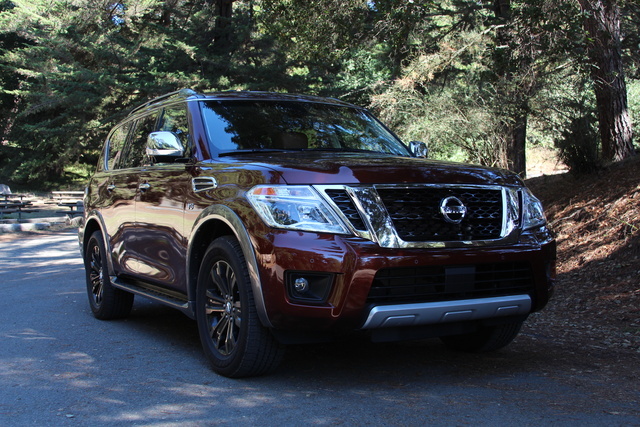 You’ll hardly notice the difference, but it must be said that this is significantly less than competitors like the Expedition, which offers 108.3, or the Sequoia, with an astonishing 120. The only competitors matching the Sequoia are the XL versions of the Expedition and Tahoe/Yukon, but the Armada does best the regular-length versions of the Tahoe/Yukon, with a higher total capacity and a lower liftover height, making the cargo area more accessible. Seats were a slight disappointment as well, because even with 6-way power and a power tilt-and-telescoping steering wheel, I had a hard time finding the perfect position. The lack of bolstering wore on me, too, and longer trips left me slightly uncomfortable. I used to love Nissan seats, but this latest batch has left me wanting, so it may just be my particular body style. I’d recommend trying them yourself and seeing if you face the same issues. 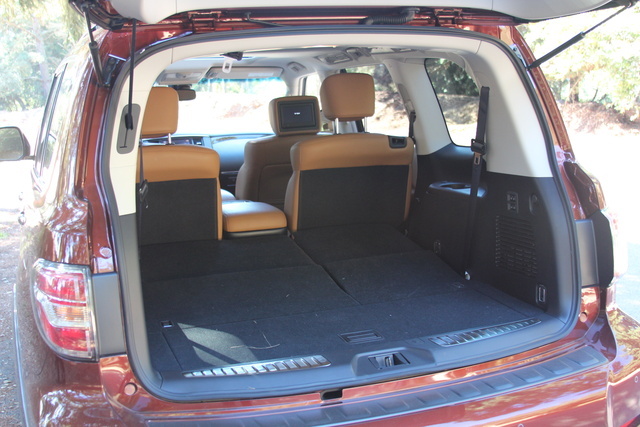 But it must be said that while the Armada’s third-row seating isn’t as comfortable as that in larger competitors like the Expedition/Sequoia, it surpasses others in the segment, allowing even smaller adults to comfortably use it. Otherwise the interior is a really impressive space, far exceeding my expectations for both this manufacturer and the price point. I’ve tested “luxury” vehicles in the same category that cost much more and failed to match this level in materials, design, or comfort. Standard parking sensors front and rear, navigation with an 8-inch touchscreen, auto LEDs, and the 13-speaker Bose stereo should be benchmarks at this level, not to mention the SL’s 360-degree top-down camera. But jumping up to that mid-level trim means you’ll also get remote engine start and a driver memory system. However, it’s not until you add the Technology Package that you really see the the benefits with its adaptive cruise, blind-spot monitoring and warning, and the forward-collision warning with avoidance braking front and rear. I just wish all of this were available if not standard for the SV trim. And speaking of that top-down camera, I’ve seen a lot of off-road guys praising its utility for wheel placement in tricky situations. I just wish the resolution was higher for a clearer view. The big disappointment here was the infotainment system. To redesign the entire vehicle and leave the old system in place (especially after a 1-year hiatus) is really confusing. Not to put too fine a point on it, but the Armada simply deserves better. This system was fine when it debuted, but the elegance of these systems has improved so much in recent years that the shortcomings are becoming glaring. Multiple screens for single inputs, too many buttons, and poor ergonomics all frustrated me after a few days, and the omission of Apple CarPlay and Android Auto just solidified my opinion. The rear-seat entertainment system makes the top-tier pricing of the Armada even more attractive, unless you want to opt out altogether. It’s included with the Platinum trim, where competitors leave it as an option, so the ability to drop the Armada’s pricing even further by canceling it would prove a significant advantage. I’m still not convinced rear-seat entertainment systems are an overall positive anyway, as a 7-inch screen isn’t much of an advantage over most tablets or even phones anymore. This alone may be enough of a reason for me to say the SL with the Tech Package is the most attractive option. If only the lane-departure warning and prevention systems were available on more than the Platinum trim. The Armada can be outfitted with every safety system you can think of, if you’re willing to venture up the trim-level ladder. I don’t like that the base SV trim can’t access any of the secondary safety features, and that lane-departure warning and avoidance are available only on the Platinum trim, but that doesn’t mean the Armada isn’t safe. With standards like stability and traction control, full-length curtain airbags, and a rear-view camera, you’re starting out in a good place, but I’d feel much more comfortable in an SL trim with the Tech Package. Crash-test evaluations have not been performed by the National Highway Traffic Safety Administration or the Insurance Institute for Highway Safety. Given that space, towing capacity, and interior design here are all among the best in the segment, especially when taking price into consideration, the Armada must be considered a deal. If space is your primary concern, check out the Expedition or the Sequoia, and you’ll be in a very good place. 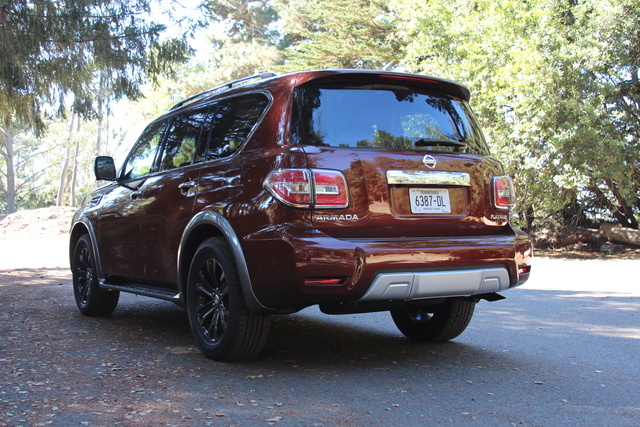 But for a plush, car-like experience with plenty of utility, the Armada won’t disappoint. My caveats would be to thoroughly test the seats and to otherwise wait until the infotainment system is updated before pulling the trigger. Sadly, there are no current rebates, incentives, or offers from Nissan. What's your take on the 2017 Nissan Armada? Have you driven a 2017 Nissan Armada? How do I lock out and restrict all phone pairing access other than mine?